"A potted history of the Australian camel corps forms the introduction to our review of the corresponding Strelets set of Australian Camel Corps, so we won't repeat that here. These men were mounted infantry, riding to the point where they were needed and then dismounting to fight while the animals patiently waited to the rear, apparently unphased by the fire fight going on around them. So when in action, as they often were, we need a set of foot figures, which is what we have here. In terms of uniform every figure here has been suitably clothed, with most wearing the standard tunic but a couple in shirt sleeves. Trousers, puttees and boots look fine, as do the famous Australian slouch hat all here wear, which is quite rightly not pinned up against the crown apart from that of the officer. The men have the essential water bottle of course, and also the haversack, but as they were mounted they were equipped with 90-round bandoliers, like the cavalry, and not the 50-round examples we find on all these figures, so that is an error. The man holding the Lewis gun has the appropriate pouches for that weapon, but we were surprised to see the crew of the Vickers machine gun had no visible personal weapons…." The Camels. Are they posed correctly or not? "Both have their left front leg being raised off the ground, but in this part of the step their left rear leg should be forward, and the rear right far back, so here the back legs are the reverse of their correct positions. This is a basic error easily checked on any number of videos of camels walking, so particularly unimpressive. Camels three and four above have all four hooves on the ground, so are not moving at all, yet their legs are widely spaced (particularly the first animal), so are standing in a very unnatural and cumbersome way"
Are they right or wrong…to me the one on the left of second pic Looks …er?..very odd. Camels for sure,,but ones that appear at first glance to be Walking in an odd way. PSR reckons they look odd as camels don´t place thier feet as shown in the sculpts..others reckon they are ok and camels do walk like that. 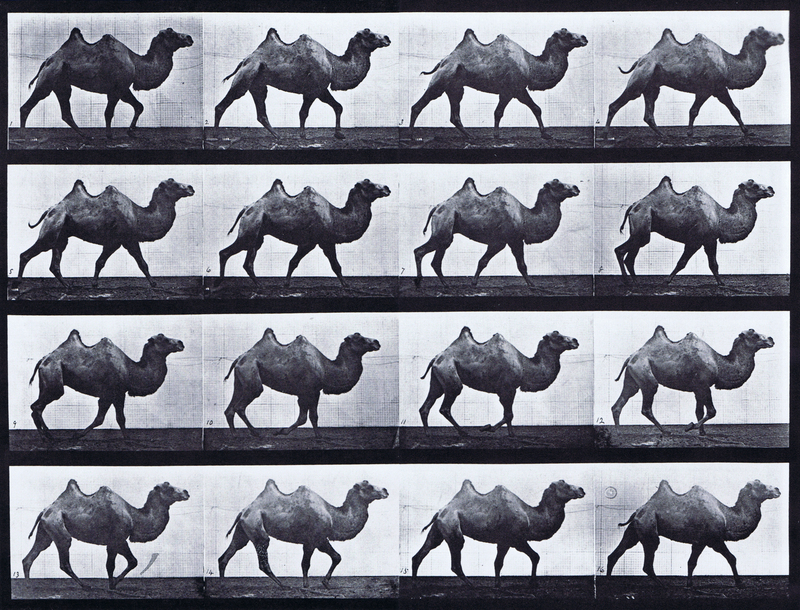 There´s a Muybridge Clip showing a camel "trotting" and it Looks (to me) as if PSR got it right for the one on the left in the second pic. As for the other poses, I´ve read PSR´s description several times and the single Frame pics fit more or less what they say about the front left leg being raised and the rear left leg being in the wrong Position..as shown in row three of the Muybridge photos but with the right legs instead of the left ones.